Usually, a set of golfing clubs consists of a number of different clubs, with each of them having its own purpose. Choosing the right types of clubs can make a world of difference to your golfing performance. Among the different type of wedges that are available, the 60-degree wedge or the lob wedge is one of the most useful clubs. Wedges are an important part of any golf club set. They are available in different lofts, finishes, bounce and grinds. Wedges give the golfer the maximum loft compared to any other type of club. The loft can range from 45degrees to 64degrees. 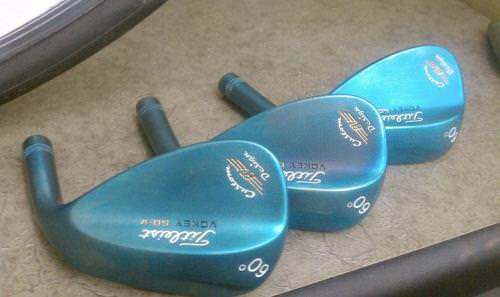 The 60-degree wedge is also called the lob wedge, and it gives you a loft between 60 and 64degrees. It is an ideal club if you want more finesse than power. It is very useful in situations where you would need to hit precise shots. It can be particularly helpful when a golfer wants to hit the ball and wishes it to rise quickly into the air. Professional golfers use it when they want the ball to land softly and with some spin from a distance of 75 to 95-yards. The lob wedge might not be included in most of the golf club sets. You would need to purchase this wedge separately. 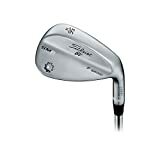 Apart from the lob wedge, the other types of wedges are the pitching wedge, gap wedge, and sand wedge. Pitching wedges have the least amount of loft, which is between 45 and 48degrees. They are usually used for shots outside of 100 yards. Gap wedges give a loft of 50 to 55 degrees and are a compromise between a sand wedge and a pitching wedge. The sand wedge is usually used to hit the ball out of bunkers or sand traps. It gives a loft ranging from 54 to 58degrees. The lob wedge can be considered one of the most controversial clubs. The reason for this is its ardent number of admirers and critics alike. Learning to master it can be tough and tricky and that may be the reason why some dislike it. On the other hand, if someone is persistent and understands how it works, they would love using the lob wedge. Apart from a good amount of loft, the lob wedge can also give you more spin when it is used properly. The process to learn and master them could be time-consuming. One would need a lot of patience, practice, and orientation to learn about its capabilities and shortcomings. Increasing the speed of the club head will make the shots fly higher, but it will have less consistency in the distance. As the loft of the club increases, the issue gets more magnified. It is advisable to not use more than 75% of your normal swing power when you use this wedge. It is better to have a narrower stance than you would have for a full swing wedge shot. Keep the feet such that they are aligned slightly left of the target line. Keeping the ball positioned towards the middle of your stance will help you have a slight forward lean of the shaft from the head to your hands. The swing should be such that there should be no excessive hinging of the wrists. A simple and ideal swing is where the motion is felt in the rotation of the body core and swinging of the arms. The technique for partial and half shots using the lob wedge would be similar. Only the length and force of the swing must be reduced to gauge the distance. Apart from the loft, the other important factors of any wedge are bounce, grind and finish. Bounce refers to the area of the club that hits the ground. Bounce is added so that the wedge does not dig into the sand or the turf. Bounce angle ranges from 0degrees to 14degrees. Depending on the bounce angle, wedges are available in standard, low-bounce and high-bounce options. The best way to decide how much bounce you would need is to consider the playing conditions or the type of course where you play most often. For playing in firm conditions such as tight fairways, choose a low bounce wedge. For playing in softer conditions, a high bounce wedge is more ideal. It can be defined as the additional shaping of the sole of the wedge. It is usually done around the heel or the toe. There are various sole grinds available. Hence it is advisable to consult a teaching professional for advice on which type of grind would suit your game. A wedge may have a distinctive color and look which adds to its visual appeal. Choosing one is dependent on personal preferences but keep in mind how they would wear over time when making a choice. A club with chrome or nickel finish will last for a long time. Dark colors look great but can wear off and leave marks as you use them in the long run. The Vokey SM6 Wedge manufactured by Titleist is a solid performer, which gives a great feel. It comes in a variety of options in order to accommodate the needs of all players. This model is available in the F grind, which is suited for traditional full shots. Great looks: The Titleist Vokey SM6 wedge is available in three finishes. You can choose from Tour Chrome, Steel Grey or Jet Black. Though all of them look classy, the Jet Black option stands out due to its exceptional looks. 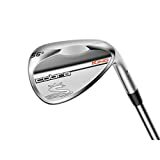 Good sound and feel: The Vokey wedge maintains the feel and sound that the other models in this range provide along with its added cosmetic changes. The touch is soft and responsive and gives you the desired feedback. Superior performance: The progressive CG technology is revolutionary regarding a design change as it gives trajectory control and consistency in distances. This adds more weight to the bottom half in high lofts while removing weight in lower lofts of the club. Players can choose from among five different grind options to suit their particular swing. Price: This product may be slightly expensive which may have a bit of impact on the number of players choosing to buy this. Can be intimidating: With so many grind options, it might be a little difficult to choose which one best suits your needs. Though it is a great product, some players with a high handicap may find it intimidating to use. 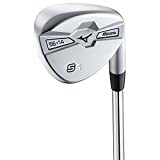 The Mizuno S5﻿﻿ Wedge gives you good forgiveness, which makes it easy to use for a number of players. It is available for both right and left-handed players. It is available in two colors: ‘Blue Ion’ and ‘White Satin’. It has an attractive Silhouette profile, which is an improved version of the teardrop shape. Attractive looks: Both the Blue Ion and the White Satin models give the wedge an unmatched visual appeal. The groove area is matte gray in color while the rest of the head is the blue ion. The likelihood of sun glare while playing is greatly reduced due to the presence of the gray matte area. There is a carve out behind the center of the face which has the Mizuno logo in it. The silhouette profile is an improvement over the teardrop shape. The wedge looks visually appealing and appears to be of the appropriate size. Well designed: The S5 is forged using Mizuno’s patented Grain Flow Forging process. It has a soft yet solid and consistent feel as it has been forged using 1025E pure select mild carbon steel. It also allows more room for error due to its long and deep face. 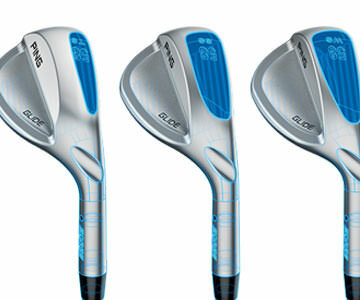 Multiple options: The profile of the S5 wedge is of the silhouette type. Along with its pairing of the distinct grinds, it is versatile for a range of shots and lies. It is available in a range of loft and bounce offerings. This ensures that the different distance gaps are covered and taken care of. The high bounce versions can play higher and low bounce versions can play lower due to these grinds. Good performance: It is very responsive to shot preferences and moves easily between the different types. It is accommodating even in the bunker for both splashes as well as more aggressive attacks. Wear and tear: The blue finish tends to wear out quickly along the sole and constant use may clear the sole. The Cobra King Wedge combines versatility and performance and has the added advantage of striking looks. It has a steel shaft and is available for both left and right-handed golfers. There are six loft options and three different sole grinds to choose from. Looks great: This is a classy and good-looking product. The Tour Notch that is present at the back of the sole has been their trademark for a very long time. The premium chrome plating gives it a durable finish and helps in reducing glare as well. Well built: The progressive milled grooves are a new groove design feature. This design features wider grooves on weaker lofted wedges. 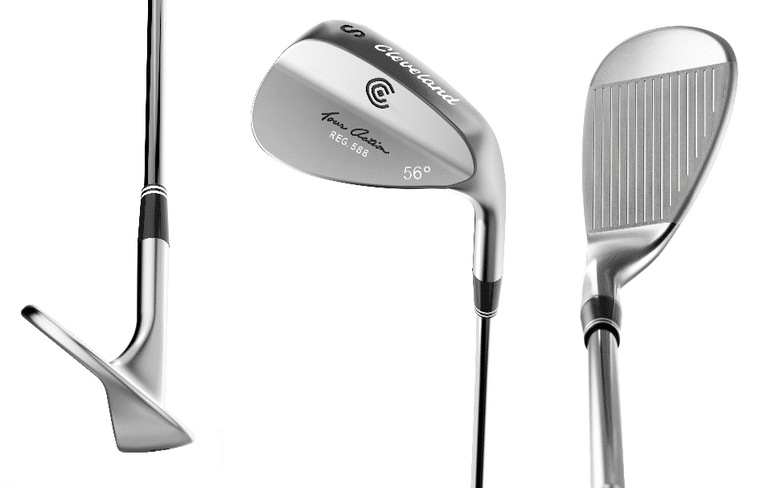 The stronger lofted wedges have narrow, tighter spaced grooves. This design helps to achieve optimum trajectory and spin. It is available in three grinds: Classic, Widelow and Versatile and each is suited for different turfs and type of players. The Classic has high bounce while the Widelow has a low bounce. The Versatile with its medium bounce is suited to medium and firm conditions. Performs well: This wedge gives a beautiful feel and sound at impact. The lower areas with a low vibration and highest parts with a high vibration are the reason behind this. The thick and tall muscle behind the hitting zone helps to improve the feel too. This wedge gives a consistently better feel in each shot. Well priced: It is one of the most affordable products in this category with its unmatched pricing. It is a complete value for money product and it will be tough to find a product to match up to it. Chrome finish: It is available only in the chrome finish, which might limit the choices for a buyer. The right sole grind: It is essential to pick the right sole grind according to your gaming needs. If unsure, it is advisable to go for the Classic grind. The Nike Engage Wedge has been designed keeping the needs of some of their best players in mind. They are available in three sole options. Nike has been a huge name in the sporting goods market and this is another superior product from the famous brand. The Nike Engage wedges come in three options for you to choose from; Dual Sole, Toe Sweep and Square Sole. The Dual Sole has two surfaces and it allows for more versatility around the greens. One surface is used when addressing the ball while the second is when the clubface is wide open. The Nike wedges have some unique features, which give it a raw and distinctive look. The soles of the wedges melt into the back of the club. Here the cavities have a geometric look to them. Apart from giving it an interesting look, it also helps to centralize the center of gravity on the wedge for consistent results. ​The wedges are packaged in colored wax depending on the grind you choose. They also have small tags attached. These list the playing characteristics to make the process of choosing the correct one simpler. Among the three sole grind, the Toe Sweep is the most interesting. It gives the golfer a great deal of versatility in different shots. It is a great choice for mid and high handicappers. The Dual sole offers more finesse. The clubs have a lot of grip. They are soft and responsive all over the face. Driving through the turf across all the three sole grinds will feel good. Futuristic look: The raw and unfinished look may look slightly chunky. It might have a limited appeal among buyers. It is a great product for golfers with a low handicap who want to bring out their maximum potential. It can help them rethink the way they approach their shots and will keep them prepared for any challenge. It is available in three finishes and its looks match up to its performance. It may be priced slightly higher than some of the other similar products in the category but it is well worth the price.